So, I took this one literally, y’all! I headed over to my to-read list on Goodreads and organized them by date to see which books had been there the longest. 1.Les Misérables by Victor Hugo. No surprise here, this book is really freakin’ long. Every single time I see it though, I want to pick it up. Maybe one day soon. 2. 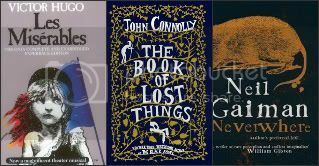 The Book of Lost Things by John Connolly. An adult(ish) fairy tale – sounds appealing. No excuse here, other than the fact that my copy is in storage at the moment. 3. Neverwhere by Neil Gaiman. Good grief, I really need to read this one. I know I’ll love it when I do! 4. I Am the Messenger by Markus Zusak. I think I added this to my TBR right after finishing The Book Thief and then pretty much forgot about it. I do own a copy though, and it is really short (and on my fill in the gaps list like a lot of these are), so I most likely will be reading it fairly soon. 5. 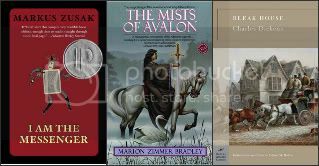 The Mists of Avalon by Marion Zimmer Bradley. A lot of friends I know and trust love this, I found a copy ages ago at Goodwill…so I don’t know why I haven’t read it yet! Somebody yell at me already. 6. Bleak House by Charles Dickens. Here is another that is no surprise, also a massive classic. 7. The Outlaws of Sherwood by Robin McKinley. Aha! Victory! This is actually in my short(ish) pile of stuff to get to soon(ish). Mainly because it is also on the fill in the gaps list. And because I like Robin Hood. 8. The Secret Garden by Frances Hodgson Burnett. I actually just read The Little Princess earlier this year finally, so I don’t know when I’ll get to this one. 9. The Last Unicorn by Peter S. Beagle. I keep meaning to pick this one up because it is Patrick Rothfuss‘ favorite book. It really is a sad day when you can’t say you’ve read your favorite author’s favorite book. 10. Tigana by Guy Gavriel Kay. An adult fantasy that everyone that has read seems to love. Some of those books sound really good. The Mists of Avalon is epically good- although extremely long. You should definitely read it one day. I’ve been on the lookout for I Am The Messenger ever since I read Book Thief, too. I have found a copy yet, though. Maybe Santa? The Mists of Avalon, Bleak House and The Secret Garden are all lost somewhere in my TBR pile too. Same reasons for most of them. The Mists of Avalon and Bleak House are gigantic and The Secret Garden just keeps getting lost in the shuffle. *gulp* You haven’t read The Last Unicorn?!?! I did not know it was Patrick Rothfuss’ favorite, although… yay! that he’s your fav author!! Peter Beagle’s book stands all by itself somewhere in Incredible. I can’t think of another book like it. I reread it this year ’cause I couldn’t shake the idea of Regret and why it was so heartwrenching to feel it. Incredible. Outlaws of Sherwood is fun… It felt like two books in one to me, ’cause Robin Hood is the main character, right? or is it Little John? No… it’s the very fun girl who falls in love with Little John!!! The Secret Garden sounds very good. I like the cover. Great books! Thank you for sharing! I have heard good things about Tigana, I would love to read it. Joyousreads recently posted..Top Ten Tuesday (5): Books Collecting Dust on My Shelves. I think you’d really love The Mists of Avalon – perfect blend of adventure, intrigue, legend, romance, betrayal, history and magic. I had to read it for a class in college, but I think I’ve read it twice since then. They did a miniseries on it a few years back – two very enthusiastic thumbs down, though. 🙁 Seriously, the book is great. Tigana and The Book of Lost Things are gathering dust in my bookshelf too! I’ve had my copy of the latter since 2007, I think? Same as The Book Thief. Good thing I finally got around to The Perilous Gard and The Last Unicorn because I’ve had those for a while as well. Neverwhere was my gateway drug into fantasy when I was in high school. I still consider it one of my all-time favorites. You should definitely make time for it!